Speak Schmeak: List-a-Palooza kicks off May 30! List-a-Palooza kicks off May 30! 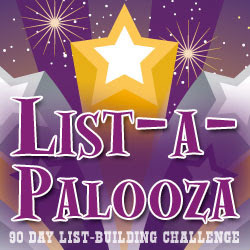 Have you heard of List-a-Palooza? It's a 90-day list-building challenge organized by PJ Van Hulle to see how rapidly you can grow your e-mail list. I did this challenge last summer and I've signed up again, because it's full of practical tools, it's fun, and it's FREE! * Get access to TWO training calls each week with some of the world's top list-building experts to share their hottest strategies and tactics with you for massively growing your list. * Be invited to participate in a weekly "Power Hour" in which we all get online together at the same time to implement ONE specific list-building tactic (this was quite fun and I met a ton of new people). Join me and let's build our lists together!